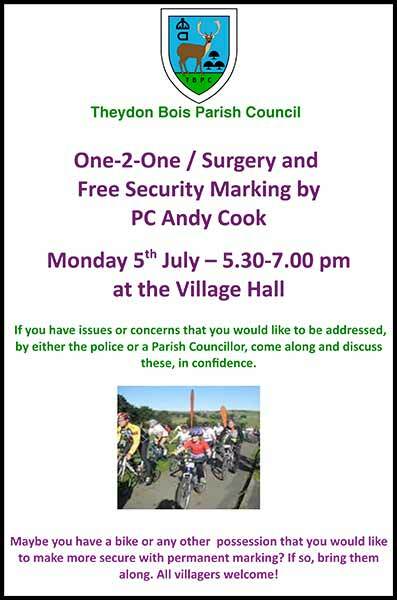 At the next Parish Council One-2-One on Monday 5th July there will be another opportunity to have your possessions security marked for free courtesy of PC Andy Cook. Wednesdays (fortnightly) from 9.20am - 10.20am at Village Hall. Thursdays (fortnightly) from 13.45 - 15.45 at Village Hall. 15.50 -16.20 at Robert Daniels Court. Below is the results of the election result for the two Parish Council seats as issued by the EFDC Returning Officer. Result of poll for the election of 2 Parish Councillors for Theydon Bois held on Thursday 17 June 2010. * If elected, the letter 'E' appears against the number of votes. 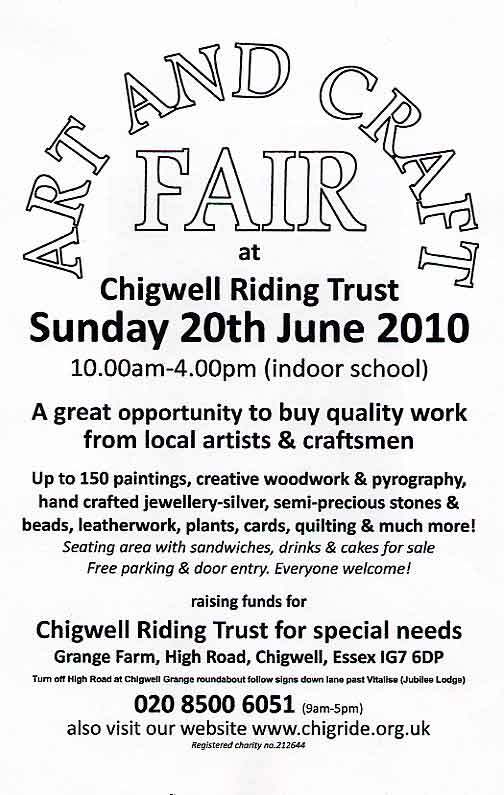 We don't normally publicise events outside the village, but a number of Theydon residents are helping out and members of Theydon Art Group are exhibiting at this event. Its also for a very worthwhile charity. In a bid to cut waiting times to clients Epping Forest District Citizens Advice Bureau will be introducing Gateway interviews at its branches over the next few months. Clients will have a short 10-15 minute interview with a Gateway Adviser and will then either be given an appointment for a full interview with a specialist or generalist adviser, be referred to another agency or given details of self help. Opening times for Loughton and Waltham Abbey remain unchanged. * With effect from 8 July 2010 telephone gateway interviews only. TBAG and Theydon Bois & District Rural Preservation Society wrote a strongly worded letter to EFDC on 28th May and asked that they extend the consultation currently being undertaken as part of the Local Development Framework (see below). This is an important report that lays the foundations for land use and development in the district for the next 20 years. We were informed on Monday that it has in fact been extended until 9 July. Please take five minutes to do your bit to ensure Theydon Bois, a village that is surrounded by Green Belt, is not left more vulnerable to large scale inappropriate or unsustainable development by completing the questionnaire. On Thursday 1st July at 8pm in the Village Hall, there will be an illustrated talk by Paul Thomson, Superintendent of Epping Forest. This will be an opportunity to find out more the latest improvements around Epping Forest and the progress with our own Avenue of Oaks. The talk is free, open to all and after refreshments will be followed by the Society’s AGM. On Sunday 4th July the Society is organising a Free Guided Walk titled 'Trees Old & New'. This will start at 2.00pm from the Village Hall and lasts for about 2 hours. "I am writing to you today to highlight our commitment in the coalition agreements where we very clearly set out our intention to rapidly abolish Regional Strategies and return decision making powers on housing and planning to local councils. Consequently, decisions on housing supply(including the provision of travellers sites) will rest with Local Planning Authorities without the framework of regional numbers and plans. I will make a formal announcement on this matter soon. However, I expect Local Planning Authorities and the Planning Inspectorate to have regard to this letter as a material planning consideration in any decisions they are currently taking." We understand that Epping Forest District Council are now formally requesting, for the second time, that the Direction to provide 34 Gypsy and Traveller pitches in the District be withdrawn. Just a reminder to residents that Neighbourhood Action Panels (NAP’s) are an informal liaison between the Police and the local community, where they aim to find what is causing problems for the particular Area. The Panel is composed of local residents & members of our local Policing Team. New panel members, of any age, will be made very welcome at our next meeting, which will be held on Wednesday June 9th at 7.30pm at the Village Hall. Meetings are held every other month and usually last for about 1 hour or so and it would be nice to see some new faces and younger members. Since March, the amount of dwelling burglaries has decreased to a very low level, I am sure this is due to you all being more vigilant and calling us when you see something suspicious. There has been a spate of shed burglaries recently where properties backing onto open land have been targeted, and garden equipment, cycles and electrical items have been stolen. If you have a garden shed or a garage that is remote from your house, please can you have a look at the security of it and maybe upgrade the locks and where possible fit an alarm. Shed and garage alarms are not expensive and are easy to fit, often a burglar will use items from a shed or garage to break into your home. Please contact Tony Ellis the crime reduction officer who is now based at Ongar police station for advice on securing your home and property, his can be contacted on 0300 333 4444. I will be holding a property marking night at the Village Hall on Monday 7th. June from 17.30- 19.00 where you can have your cycle post coded and receive marker pens and advice, on marking other property. We ran Street Watch in Theydon Bois on Friday 21st. and Saturday 22nd. May, I am pleased to say that it was quite on both nights and there were no crimes reported during the time I was there. I would like to thank you all for your work in helping in helping me keep the Village safe, we the police do rely on you to be our eyes and ears, so please keep up the good work and I can assure you that all call to us are confidential and we will not call on you if you do not want us to. As some Villagers are already aware EFDC are in the initial stages of preparing a Core Strategy for the Epping Forest District District – part of the Local Development Framework (LDF) this is the key new planning policy document which will look ahead to 2031 and eventually replace the Local Plan. They have commissioned a large number of studies, on issues such as housing and employment needs, which will be the “ evidence base” from which they will start to prepare new policies and proposals to deal with land use and development issues up to 2031. The Sustainability Appraisal Scoping Report is a 141 page draft consultation document that therefore forms a very important basis for local development for the next 20 odd years. In this report Theydon Bois has been grouped with Loughton and Buckhurst Hill and highlighted as having a low to moderate sensitivity to change. Both Theydon Bois Rural Preservation Society and Theydon Bois Action Group believe this to be an inappropriate grouping and characterisation and have therefore prepared a basic response to the online consultation questionnaire that accompanies the report. They have prepared this basic guidance to aid residents make replies to what they regard as a very important consultation that could have future detrimental consequences for Theydon Bois. They urge as many villagers as possible to respond to the consultation so as to add weight to the detailed responses that they are both preparing. 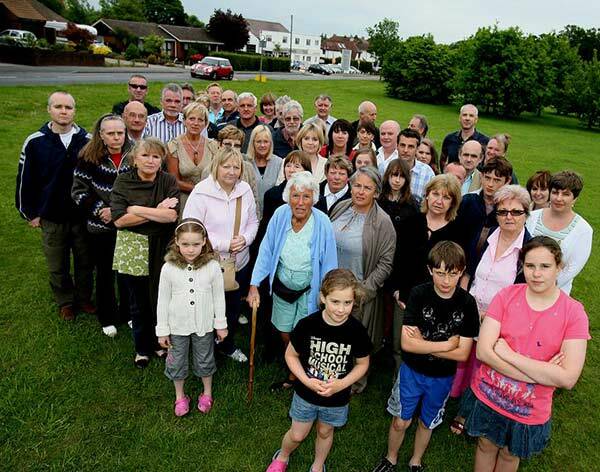 The Preservation Society and TBAG have jointly requested an extension to the present closing date of 18th June, but this may not be agreed to so both groups are asking villagers to try to respond by Friday 18th June. See earlier details of this production below. An election for the two vacant Parish Council seats (see below) will take place on Thursday 17th June. The venue for the Poll will be St Mary’s Church Hall.There are three nominated persons as listed below by the Returning Officer on 24th May. The following is a statement of the persons nominated for election as a Parish Councillor for Theydon Bois. The persons above against whose name no entry is made by 'Reason why no longer nominated' have been and stand validly nominated. front row: Tricia Haslehurst, Ann Harrison. 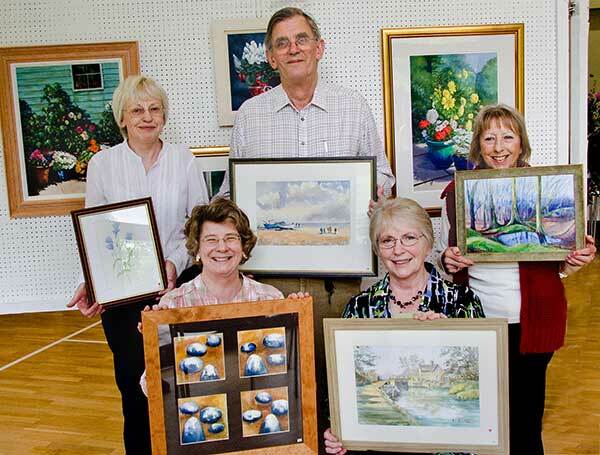 Theydon Art Group had a very successful exhibition of paintings at the village hall on 14th and 15th May. Over 130 framed paintings and some unframed drawings were on show to the public and refreshments were available. There was a wide variety of subject material: landscapes, animals and flowers were very popular. Visitors came from Theydon and from various surrounding towns and villages. Many of them complimented us on the quality of the paintings. Most of the paintings were on sale and thirty were sold. The group is essentially amateur, but artists love to sell their pictures. Someone said ‘Lots of people say how nice your paintings are, but you never know if they mean it. When they get their money out and buy the picture, you know they really like it.’ Prices are usually modest and, even for those who sell, there is little profit after the expenses of framing, the club’s commission (used to cover the expenses of holding the exhibition), and the costs of preparing those pictures which do not sell. ‘Charity Squares’ were also on offer. These are members’ original paintings, 10 cm square, which are sold at £5 each. Pete Smith, the husband of member Vi Smith, makes and donates matching mounts and frames, with the entire proceeds going to a chosen charity. Vi Smith herself sold a variety of cards and raised £39 for the charity. This year’s charity was the Alzheimer’s Society. In recent years the amount raised has been over £200 annually. 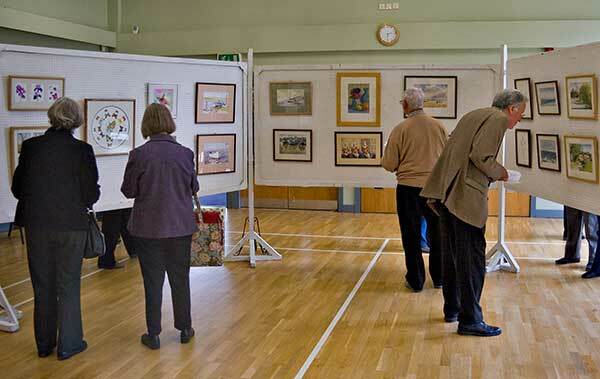 In the winter the Theydon art Group meets regularly in the village hall on the second Friday evening in each month. Usually a visiting professional artist gives a demonstration or gives a critique of members’ pictures. In the summer, coach outings or sketching visits are organised. Membership is limited to forty nine and, at present, there are no vacancies. 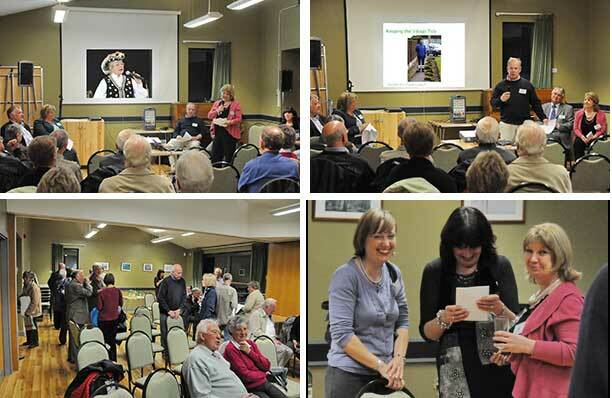 Villagers enjoyed drinks and nibbles and an informal chat with Parish Councillors and other villagers about the last year in Theydon after the presentations at the Annual Parish Council Meeting on Thursday 13th May. 15th May 2010 DON'T MAKE IT EASY FOR THE BURGLAR!! There have been a number of burglaries throughout the Epping Forest District which could have been prevented if the householder had been a little more aware of their security. Most of these burglaries have occurred during the night and involved intruders 'popping' open a upvc front door. Their target is your car or van which is sitting on your driveway but they will also take anything else you leave lying around in the hallway. They spend only seconds in your home in an effort to locate the ignition keys to your vehicle and they are remarkably successful at finding them. There are several simple steps that you can take to prevent yourself falling victim to one of these crimes…..
Be inventive about hiding away your ignition keys when you go to bed. Don't leave them in a coat pocket in the hallway, on a hook in the kitchen, on a cupboard in the hall or on the kitchen or dining room table. Burglars know that that is where they are usually found. Don't leave your house keys where they can be seen through the letterbox in your front door. Burglars have become extremely adept at fishing them out through the letterbox with a cane or rod. These simple precautions take seconds to implement but could mean the difference between whether you wake up with your car on the driveway or missing. 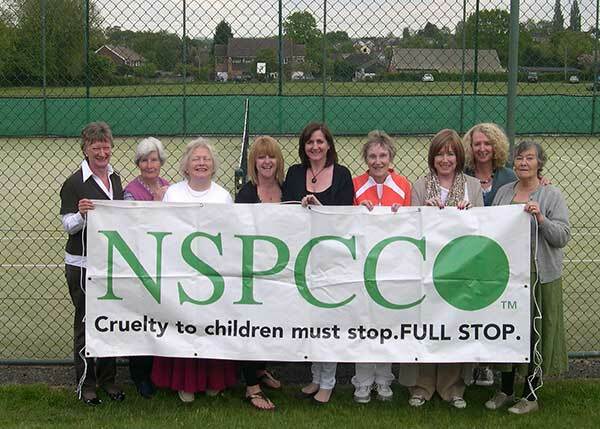 Theydon Bois Tennis Club again hosted a Charity Tennis Tournament in aid of the NSPCC on Thursday 13 May. The tournament has been running for over 20 years, and was superbly organised by Pat Walter and the NSPCC Committee - even the sun came out for the first time this year. £900 was raised for the charity. The ladies enjoyed four hours of tennis and a fabulous lunch. There were 46 entrants this year, including a strong turnout from the host club and players from across the district. 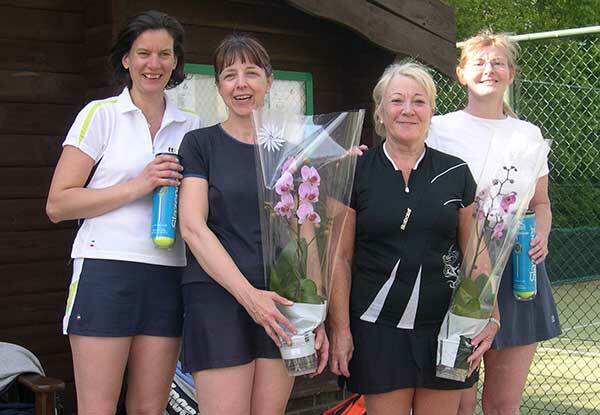 The final proved to be an all-Walthamstow TC affair between the eventual winners Andrea Broughton & Inez Cordeiro, and runners-up Daniella Witton & Gail Farrow. Judging by some of the comments the tournament will have to return next year: 'Best tournament around'; Love the club - if I ever move here I'll join'; 'Wonderful friendly atmosphere'. Following the resignation of Parish Councillors, Mrs. Jacqueline Dodman and Mike Emmett and ten or more local government electors having requested an election See below nominations are now being sought by Thursday 20th May. If nominations result in an election the poll will take place on Thursday 17 June 2010. Election of Parish Councillors for Theydon Bois. An election is to be held of two Parish Councillors for Theydon Bois. Forms of nomination for the Parish Election may be obtained from Clerk to Parish Council or Civic Offices, High Street, Epping, Essex CM16 4BZ from the Returning Officer who will, at the request of an elector for the electoral area prepare a nomination paper for signature. 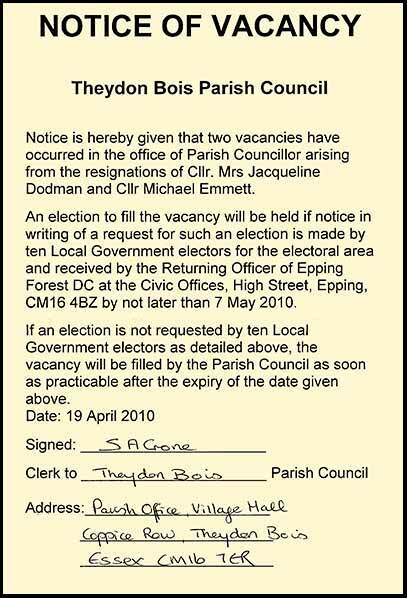 Nomination papers must be delivered to the Returning Officer, Civic Offices, High Street, Epping, Essex CM16 4BZ on any day after the date of this notice but no later than noon on Thursday 20 May 2010. If any election in contested the poll will take place on Thursday 17 June 2010. Applications, amendments or cancellations of postal votes must reach the Electoral Registration Officer at Civic Offices, High Street, Epping, Essex CM16 4BZ by 5pm on Wednesday 2 June 2010. Applications to vote by proxy at this election must reach the Electoral Registration Officer at Civic Offices, High Street, Epping, Essex CM16 4BZ by 5pm on Wednesday 9 June 2010. Applications to vote by proxy at this election applied for on grounds of physical incapacity, where that physical incapacity occurred after 5pm on Wednesday 9 June 2010 must reach the Electoral Registration Officer at Civic Offices, High Street, Epping, Essex CM16 4BZ by 5pm on Thursday 17 June 2010. 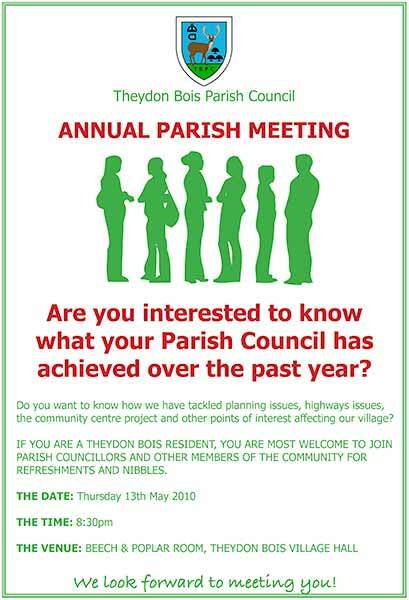 The Parish Council intend that this years Annual Parish Meeting next Thursday (see below) we be a less formal affair. Sue Jones will do a Chairman’s Report but this will be split into the various Council activities and other Councillors will contribute. 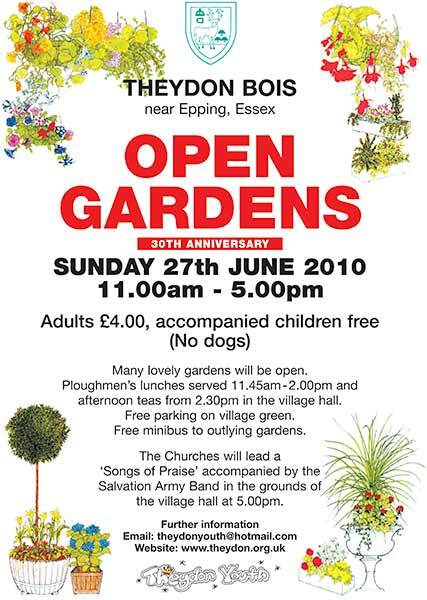 Peter Gooch will do a short presentation on the work of the Planning Committee, Anthony Purkiss will report on improvements in the Cemetery with photos etc and Sue Sowerby and our Parish Clerk, Sally Crone are putting something together regarding the Elders Events taht proved so popular this year. 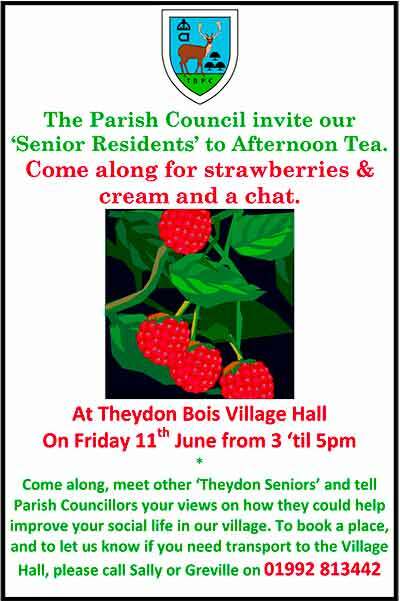 Parish Councillors are requesting that as many villagers as possible join them for drinks and nibbles and an informal chat with Parish Councillors and other Villagers about the last year in Theydon after the presentations - all are very welcome. On Tuesday 1st June between the hours of 6pm-8pm at The George and Dragon, 208 High Street,Epping. Please come and meet the local Macmillan Cancer Support Fundraising Manager and find out how you can help people living with cancer. We are currently in the process of setting up a fundraising group in the Epping area and would love to see as many of you there as possible! 1 in 3 of us will receive a cancer diagnosis at some point in our lives and currently Macmillan Cancer Support can only help 1 in 2 of those people diagnosed. That’s why we need your help, we are trying to set up a new and exciting fundraising group within Epping and its surrounding areas. Macmillan’s Fundraising groups help people living with cancer and have fun doing so. Whether you organise a 70’s night, a quiz or a ball every penny you raise will help to improve a life. In 2009 Fundraising Groups in the UK raised millions of pounds. Volunteers really are vital to the work that Macmillan does and together we can reach Macmillan’s ambition of reaching everyone affected by cancer. The East Herts Fundraising group, based in Bishop’s Stortford, Hertfordshire have been up and running for nearly 2 years now and amazingly raise around £6,000 each year which is fantastic. They have also raised awareness of the charity in their local community and spread the word about the services that Macmillan offers. 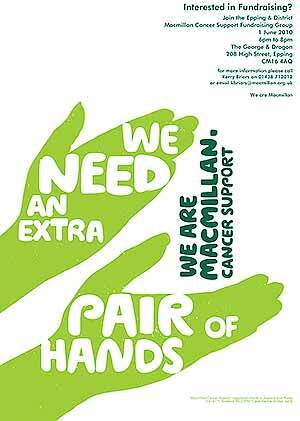 If you or someone you know has a small amount of spare time and would like to make a difference to someone’s life please contact us to find out how you can get involved, be part of Macmillan Cancer Support and improve the lives of people affected by cancer. If you are interested in being part of your local fundraising group or to find out more information on the charity please call Kerry Briars on 01438 712012 or kbriars@macmillan.org.uk. Sue Jones (Conservative), present chairman of our parish council, will replace Roland Frankel (Liberal Democrat) as a district councilor for Theydon Bois ward following yesterdays district council elections. Voting took place for only one of the two Theydon Bois ward seats at this election. Theydon Bois also had the highest turnout of any Epping Forest ward at 74%. The turnout in the 2008 election for the other Theydon Bois ward seat when John Philip (Conservative) was elected with a majority of 161 votes was only 51%. A Conservative Win. Susan Margaret Jones was elected with a majority of 176 votes (7%). A Total of 2403 votes were cast, representing a turnout of 74%. Sitting MP Eleanor Lang was returned as MP for our district with a 1.3% increase in her vote over the 2005 election (54.0% against 52.7%). Overall because of the increased turnout and labour losses there was a swing from Conservative to Liberal Democrat of 1.1%. Voting also took place yesterday for some of the seats on Epping Forest District Council including a Theydon Bois seat. The count for these is taking place today and we will post the result when available. 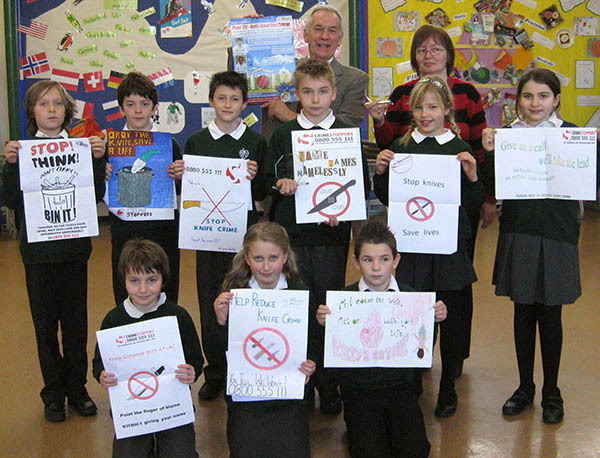 The children were asked to design a poster about knife crime as well as answer questions from the Crimestoppers’ websites. The competition was backed by top cricketers Essex cricket captain, Mark Pettini, Essex player and England captain, Alastair Cook, and Essex and England player, Ravi Bopara. Daniel McCarthy's (2nd row centre) poster won his 30 class mates a special day of cricket coaching and watching a match at the county cricket ground in Chelmsford and a trophy. 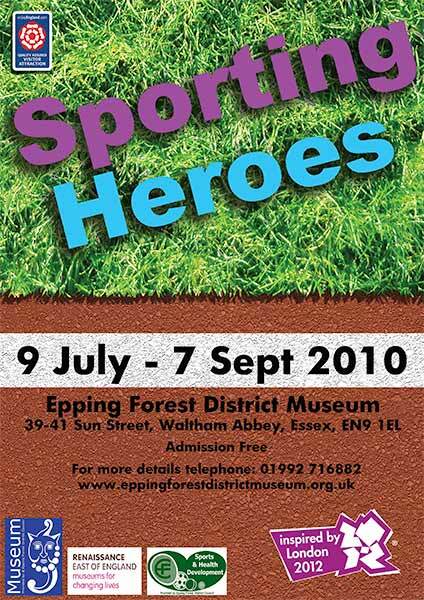 Grants of up to £500 are up for grabs for community groups or organisations based in rural Essex to hold a sporting event this summer to mark the two year countdown to the 2012 Olympic and Paralympic Games. Essex Legacy from the 2012 Games, which is led by Essex County Council, is making grants of up to £500 available for rural community groups to organise events during this year’s Open Weekend on 23-25 July. Now in its third year, Open Weekend is a nationwide event which marks the date of the opening ceremony for the London 2012 Games. It enables people across the UK the chance to take part in sport, arts and cultural activities in their local area. The theme for this year’s Open Weekend is ‘set a challenge’ to encourage people to participate in any sporting or physical activity. Local community groups are being invited to organise an event that challenges the public to participate. The event could be anything from a treasure hunt to tai chi, wrestling to walks – as long as it involves getting people physically active. Cllr Stephen Castle, Cabinet Member for Education and the 2012 Games, Essex County Council said: ‘The Open Weekend celebrations provide a great opportunity for all the communities of Essex to be involved in the run up to the 2012 Games. By making grants available, we can offer those living in rural communities the chance to participate in sports and physical activities that they may not have tried before. These ‘come and try’ sessions could potentially spark a new interest or activity that individuals may want to participate in long-term’. Gary Sullivan, Chairman of Essex Strategic Board for the London 2012 Games added: ‘Open Weekend gives local groups the chance to showcase themselves and inspire others to join in with their activities. I’m looking forward to seeing how imaginative the events will be this summer’. Theydon Bois Action Group have arranged a Question Time for prospective councillors in the forthcoming district council elections. On Tuesday 4th May at 8pm At the Village Hall, Coppice Row. Have you got a question regarding the Gypsy & Traveller situation and how it affects you and your family? 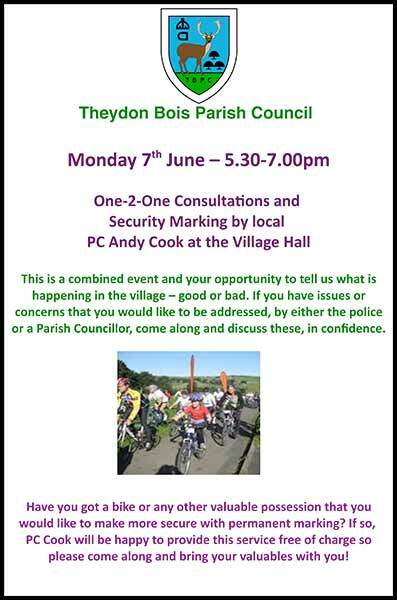 Do you want to know what the prospective Theydon Bois ward district councillors are doing and what they have done to halt the inappropriate location of Gypsy & Traveller sites in our village? All three prospective ward councillors, Roland Frankel, Sue Jones and Daniel Kieve, will be present to answer your specific questions about the G&T situation. Thanks to the generosity of the Conservators of Epping Forest, this years Donkey Derby will again be held on the Village Green. 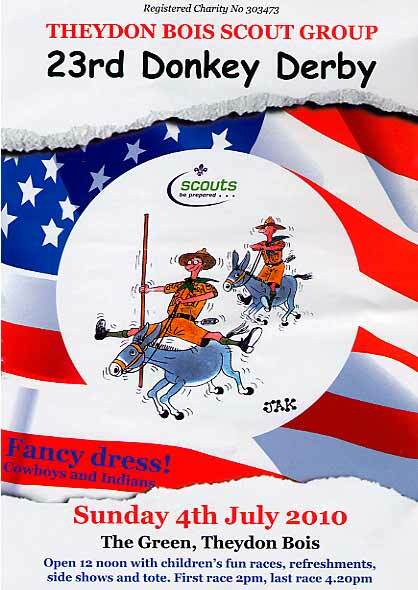 This will be the scouts 23rd event and the money raised enables us to support our Beavers, Cubs, Scouts, Rainbows, Brownies and Guides. This year we will also be offering support to other local youth projects and the St. Clare Hospice. It’s only through the generosity and support of local people and businesses that this event will succeed and you can help, either by giving some time to the event, making a donation, providing Bric a Brac, or by advertising in our race day programme. Helping The Donkey Derby has become one of the highlights of our village life and the scouts seek more help to organise and run the event. Monthly meetings are held in the Queen Vic and if you would like to be part of a friendly team of volunteers, give Bob Penman a call on 01992 813709. Any amount of donation is welcome. A minimum donation of £15 will entitle you to own a donkey in the race card and you can give it your own special name. Winning owners will be presented with a trophy. A minimum donation of £75 will entitle you to name one of the races in our Donkey Derby programme / race card and include some advertising at the bottom of the list of donkeys. 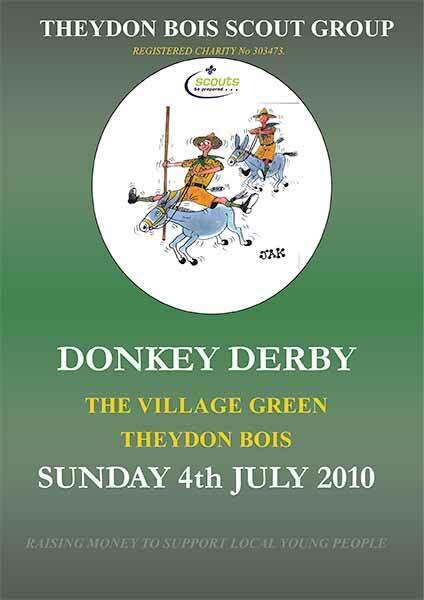 You can download a pdf form here or or go to www.donkey-derby.info for more information. If you are a tax payer you can increase the value of your contribution by completing the gift aid section. 34 Blackacre Road, Theydon Bois, CM16 7LU. 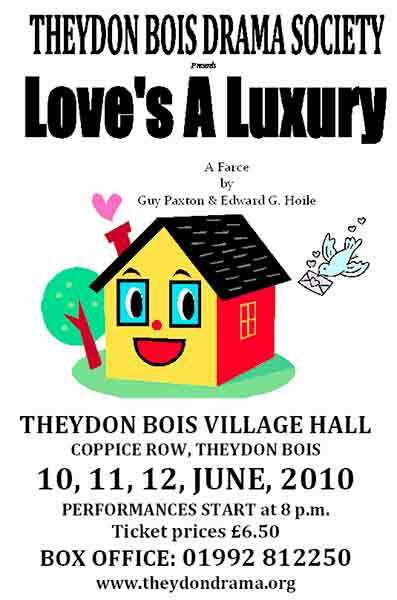 Theydon Bois Drama Society's next production, Love's a Luxury is an extremely funny, fast-paced farce set in the 1950s. Pentwick, a theatrical impresario, and Bentley, a famous actor, come down to spend a quiet holiday in a country cottage with elderly Mrs Harris to look after them. Unfortunately, Mrs Harris has gone away, leaving her pretty young daughter Molly in charge. When Pentwick's suspicious wife Margaret unexpectedly arrives, a series of elaborate deceptions are hurriedly put in place - with hilarious consequences. Tikadi one of our Village Hair Dressers will be holding an amazing evening at the Woolston Manor golf & country club, Chigwell, Essex, on 16th June 2010 and its all in a fantastic cause in association with John Fredas Hairaising. The aim is to national raise enough to build a new neurological operating theatre. See also the Tikadi Website. Back again for its third year, the St Clare Hospice Midnight Walk will be taking place on Saturday 19th June in Harlow town centre. The 10k route will leave the Water Gardens, outside Asda at 10.30pm and follow a circular route along cycle tracks into Old Harlow. 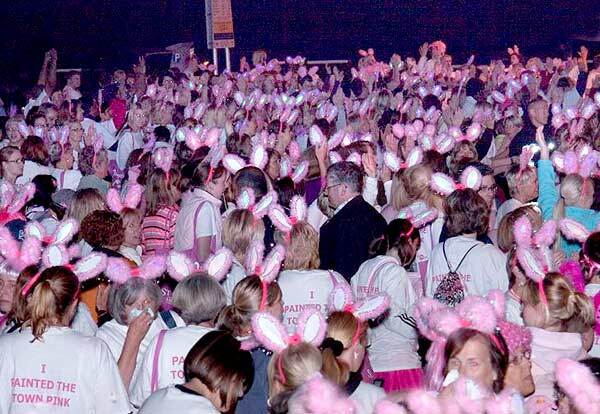 The Midnight Walk has been well supported by teams from Theydon in previous years and is now infamous for its pink flashing bunny ears and everyone is invited to dress up in their finest fancy dress! Organisers were hoping that the walk taking place in it’s 20th birthday year would reach record heights of 2,000 entrants but initial sign up has been slow…so come on girls, what are you waiting for? Visit www.stclarehospice.org.uk to register online or call (01279) 773 750 or email midnight@stclarehospice.org.uk for an application form. Two of the present Parish Councillors, Mrs. Jacqueline Dodman and Mike Emmett have decided to resign and this now creates vacancies that need to be filled. If ten or more local government electors for our village request an election by writing to the Epping Forest Returning Officer by the 7th May then one will be held. If not then the Parish Council will try to co-op people to fill the vacancies as soon as possible after May 7th. The Official Notice is below. A Motorcyclist was killed in a crash in on the Abridge Road at around 11.25am today. A police spokesman said the driver, of a yellow BMW bike, was pronounced dead at the scene. A section of the road where the crash happened, between Coopersale Lane and Epping Lane, was still closed in both directions at lunchtime. So far details about the driver's age and identity have not been released. A spokeswoman for the East of England Ambulance Service said a rapid response car, two ambulances and a crew from Hertfordshire Air Ambulance all attended the scene. This is the second recent death from a road accident in our village. On Friday 5th March a man was killed in an accident in Coppice Row. 130 people turned out, including many children on what was a very damp morning, for a guided tour of the Epping Forest Deer Sanctuary. Everyone then joined us at our home for a hot drink and a slice of home- made cake, we thoroughly enjoyed meeting up with so many lovely people. Thanks to the generosity of our supporters, before, during and since the event, we have been able to send a cheque for £1500 to the Alzheimer’s Society to help with their work. We would especially like to thank the Sixteen String Jack Pub for allowing us use of the car park and donating proceeds from various events to the fund. vote. It's as simple as that.